We already tested the ASUS RT-N15 model in our lab, today here is its co-brother RT-N16 which is a top model in the ASUS wireless routers series. With RT-N15 we failed to get the routing speed exceeding Fast Ethernet capabilities, that’s why we think that the GE WAN-port is not really in demand there. Let’s see if it will be possible to get the desired speed with RT-N16. ASUS RT-N16 design is not unique. We’ve already seen a similar case with WL-500W: the same shape, the same three antennas, though this time they are removable. However, first things first... The sample mass is 470g, and its dimensions are 216*161.9*40.5mm. There’s a ventilation grate and a vendor label on the top side of the router. On the bottom side of the router, there’s also a ventilation grate, four rubber stands, and angle-shaped manufacturing holes that allow placing RT-N16 not only on the table but on the wall as well. Beside the indicated features of the bottom there is also a sticker with short information about the device. The side panel doesn’t have anything peculiar about it but it is clearly seen that the model case under testing is not block-shaped because the top side is a little wider than the bottom. There is model and manufacturer information of the equipment under discussion on the front panel and seven LEDs indicating the device and port status. The most interesting part here is the rear panel of RT-N16. On it, there are connectors for three outer antennas and two USB 2.0 connectors for printers and flash-drives, and five RJ-45 ports (four LAN-ports and one WAN-port), and a connector for external power supply and two buttons WPS and Reset, designed for easy connection of wireless clients and resetting to defaults respectively. External power supply with 12B constant voltage and 1.25A current is necessary for the model operation. Let’s have a look inside the router. 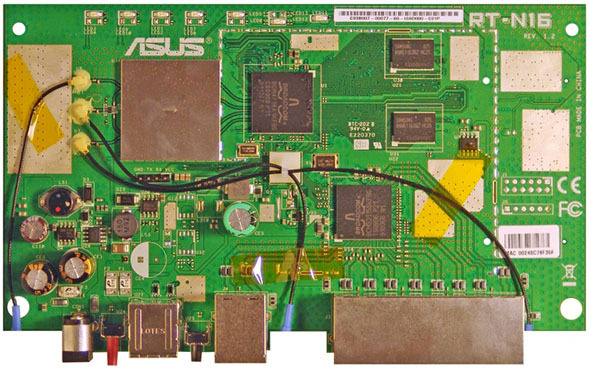 The ASUS RT-N16 wireless router consists of one double-sided board made of green textolite. There is only one element on the back of the board - Spansion flash-memory S29GL256P with the capacity of 32 MB. There is a Broadcom BCM4718 533MHz SoC CPU on the front side. This chip is represented in the photo below without the glued radiator. A non-blocking Broadcom BCM53115 switch chip deals with gigabit ports commutation. Two Samsung DDR2 K4N51163QZ-HC25 modules with the capacity of 64 MB were used here as RAM. So RT-N16 possesses 128MB RAM. Earlier these chips were used in video cards, e.g., in Palit HD 4650 Super 512MB DDR2 or ASUS EAH4350 SILENT. 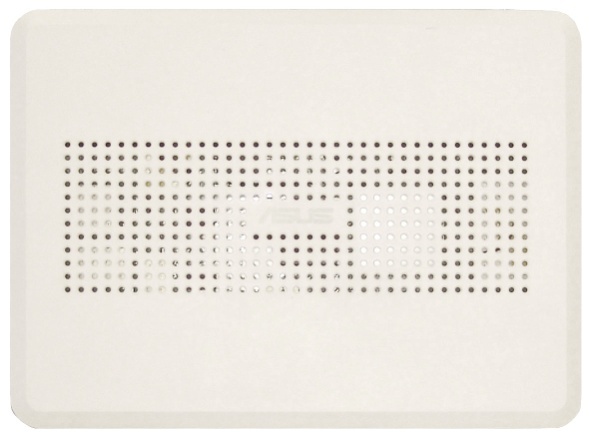 The wireless module is covered with a non-removable metal screen, that’s why it was not available for visual observation. 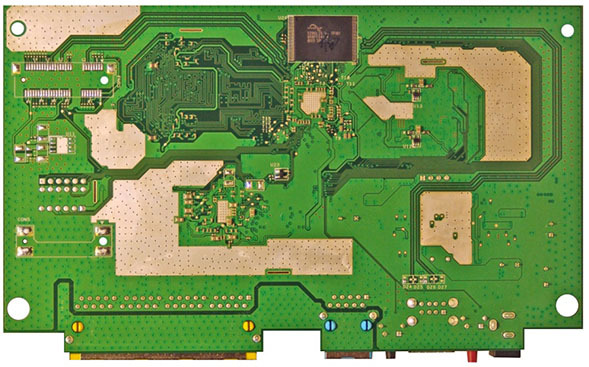 We didn’t find any other interesting chips on the RT-N16 wireless router board. This section will be a little different from usual parts of similar reviews. Firmware upgrade will be described both for official and alternative firmware. 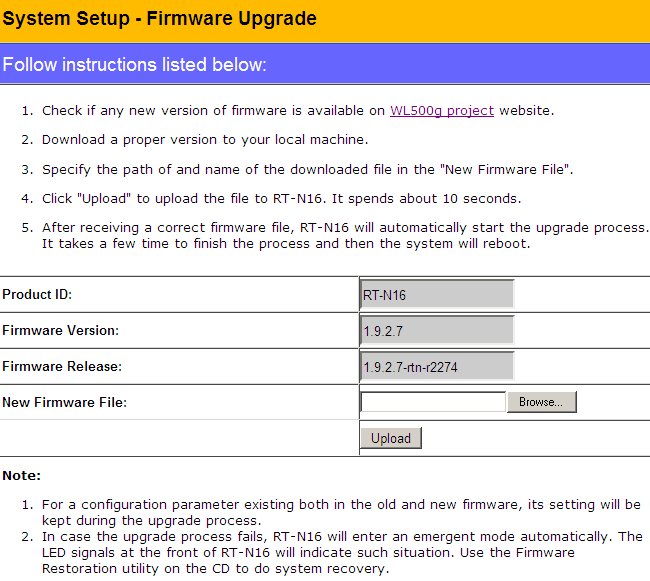 Let’s start with firmware upgrade released by the router manufacturer. We downloaded the RT-N16_9.9.4.75.trx file from the Russian ASUS forum because this is one of the latest beta-versions of firmware. The latest stable release hosted on the site is 1.0.1.2. Apparently, the user should not be embarrassed by ASUS refusal to use big numbers of firmware, i.e. return to the numbers of the first series (from 9.9.4.75 back to 1.0.1.2). Old firmware versions were deleted from the manufacturer’s web-site. In order to begin the upgrading process it is necessary to refer to the Firmware upgrade item of the Administration group. To get access to this group one should go to the Additional settings menu item. To change firmware version is comparatively easy. The only thing to do is to choose a file with new firmware and click Upload, the rest will be done automatically. 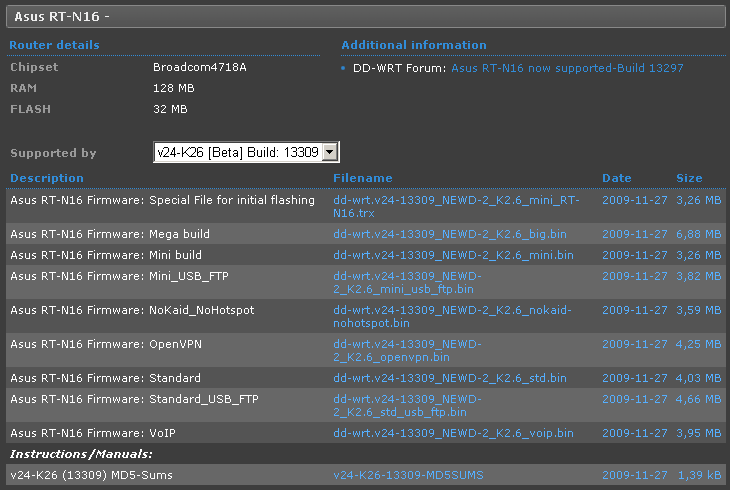 The users have already got used to the presence of firmware «by Oleg» for Asus wireless routers. RT-N16 is no exception. When this part of the article was being written, two firmware versions 9.74.0.1 and 9.74.0.2 were available. We are going to upgrade up to the latest available version. That’s why we uploaded the RT-N16_9.74.0.2.trx file. 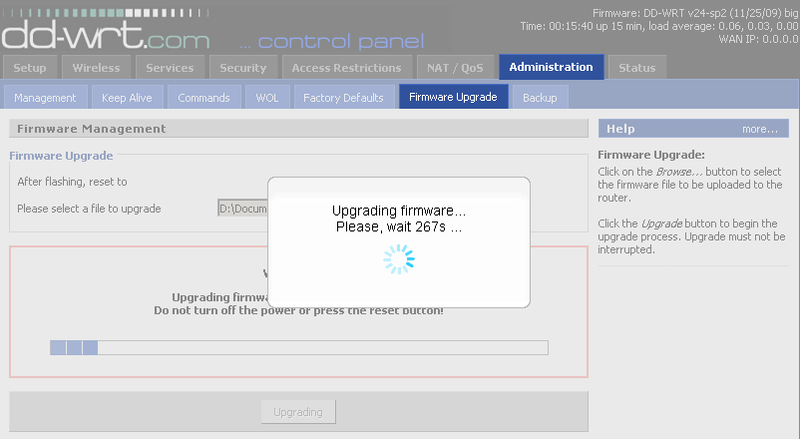 The process of this firmware upgrade is similar to that of the original one. The only thing to do is to “upload” the trx-file into the router by means of the web-interface. So far, no new features have been added but the errors in the existing original firmware have been corrected. That’s why we go to the other alternative firmware upgrade. When the article had been completed, we decided to look what changes had taken place in the alternative firmware and discovered that a new project had appeared which is renewed alternative firmware “by Oleg”. Here, there are two firmware branches that go in parallel: the main one based on the version 2.4.37 kernel and an experimental one on the 2.6.22 kernel. They have build numbers 1.9.2.7-d and 1.9.2.7-rtn respectively. 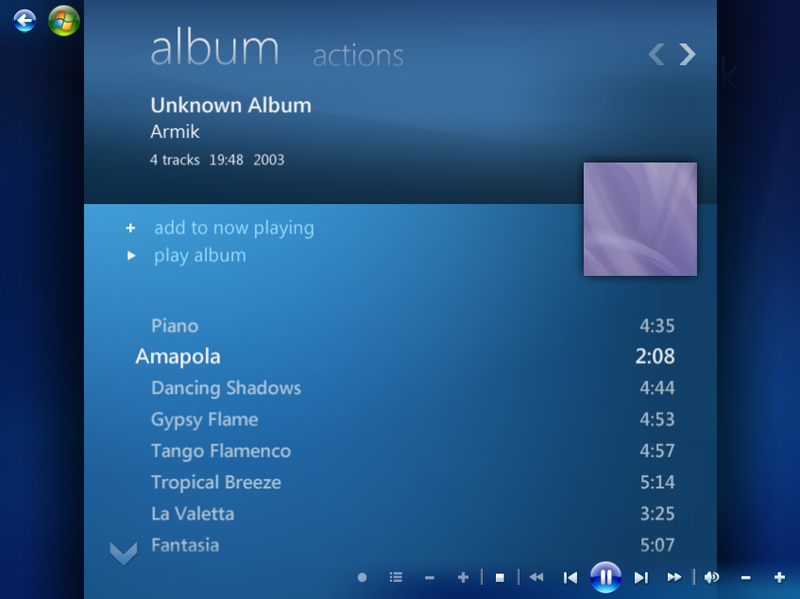 We decided to upgrade up to the experimental version 1.9.2.7-rtn. The upgrade is performed in the way identical to original firmware; moreover the most successful parts of the code and corrections from this alternative branch get to the original firmware as well. Quite a different situation is with the DD-WRT firmware. 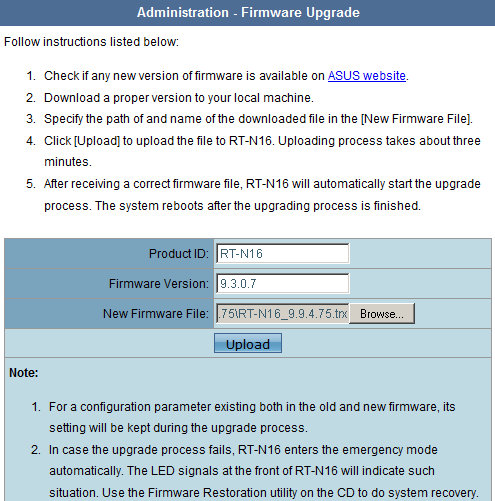 The process of firmware upgrade is carried out in two stages: first, create a special image «Asus RT-N16 Firmware: Special File for initial flashing» dd-wrt.v24-13309_NEWD-2_K2.6_mini_RT-N16.trx, and then upload the main firmware file. Let’s begin. 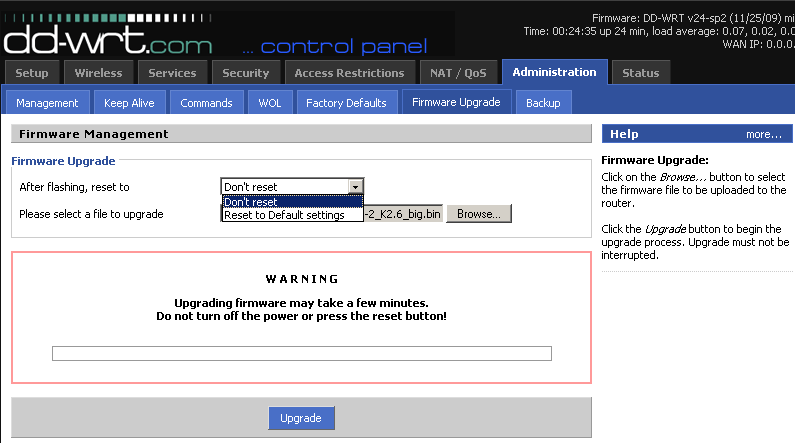 After the firmware upgrade it is necessary to connect to the router via IP-address 192.168.1.1, because all the settings have been reset. After entering it is necessary to specify the user name and password. These data are used for further control. After the initial firmware has been uploaded we can choose functional features which the main firmware should possess. There are eight available firmware versions. The more functional features have been implemented in the firmware the bigger is the size of the image file. After the necessary firmware version has been downloaded to the administrator’s PC we can proceed to upgrading up to the full version. For this purpose it is necessary to go to the Administration menu and choose the Firmware Upgrade submenu. Here the user may specify the file with the new firmware and indicate whether it is necessary to reset to default settings after flashing. Each upgrading takes approximately five minutes. It is two minutes longer than upgrading in the standard firmware. Returning to the standard firmware is performed in one and a half stages. First, it is necessary to rename the file-image giving to it a bin file extension, and then upload to the Administration-Firmware Upgrade menu. We haven’t considered one more firmware - Tomato. 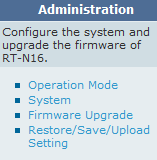 This firmware is also supported by RT-N16, but by now only in the version by teddy_bear from the linksysinfo.org community. 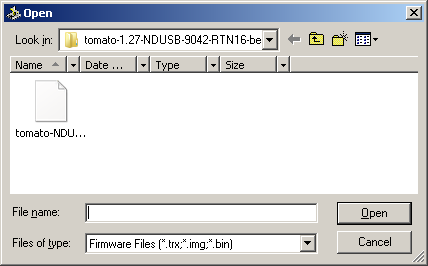 A jump to Tomato is possible in two ways: by means of an upgrading sequence via web-interface («Asus RT-N16 Firmware: Special File for initial flashing» from DD-WRT and then to Tomato firmware itself), or it is possible to use the utility for firmware recovery. We have not yet considered the latter in our review, that's why we'll use it. 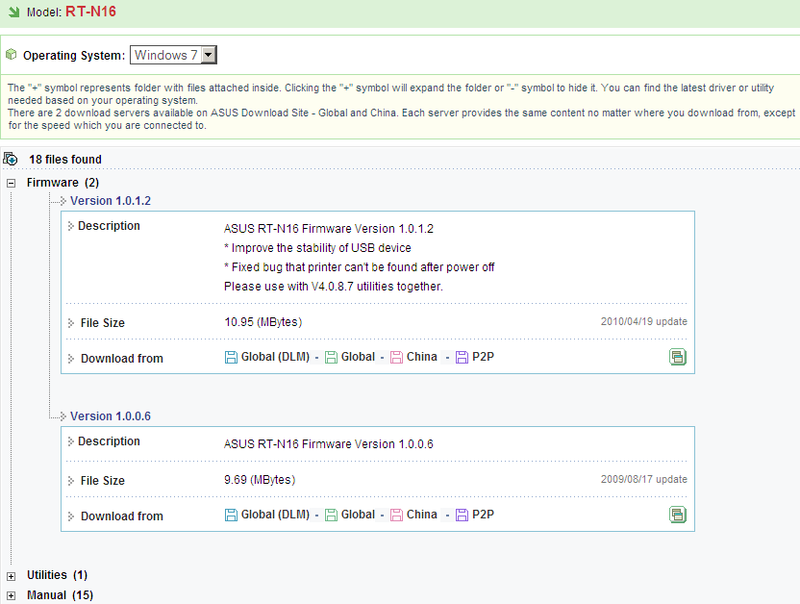 First it is necessary to download the latest version of the ASUS RT-N16 utility. This program contains necessary software for firmware recovery. To put the router into the firmware rescue mode you need to hold the Reset button at the device rear panel when turning the device on till the equipment status LED starts to flash. Now it is necessary to launch the recovery utility program, specify the file with the new firmware and click the “Upload” button. 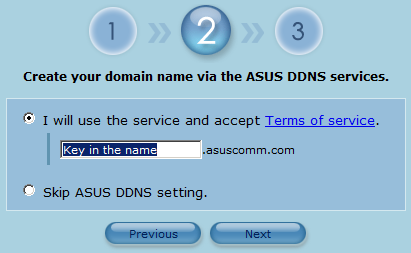 After the “recovery” procedure is over it is possible to start the browser and connect to ASUS RT-N16 at address 192.168.1.1. You can return to the original firmware by means of the required image uploading via the web-interface. We’d like to draw the reader’s attention to the fact that after each firmware flashing it is recommended to reset all user settings to defaults and configure the equipment again. In the case when the vendor’s firmware recovery utility is unavailable or cannot be used, there’s an alternative way to recover the router’s firmware or to upgrade it. For such upgrade one has to turn RT-N16 on the mode where only the boot loader works. If the user has encountered a problem while upgrading, the router will get to the boot loader mode by itself (the power indicator is flashing slowly). To manually put the router into this mode one has to press the Restore button on the RT-N16 case and while holding it switch the power on and release the button after 10 seconds. Then you have to connect to one of the LAN ports. 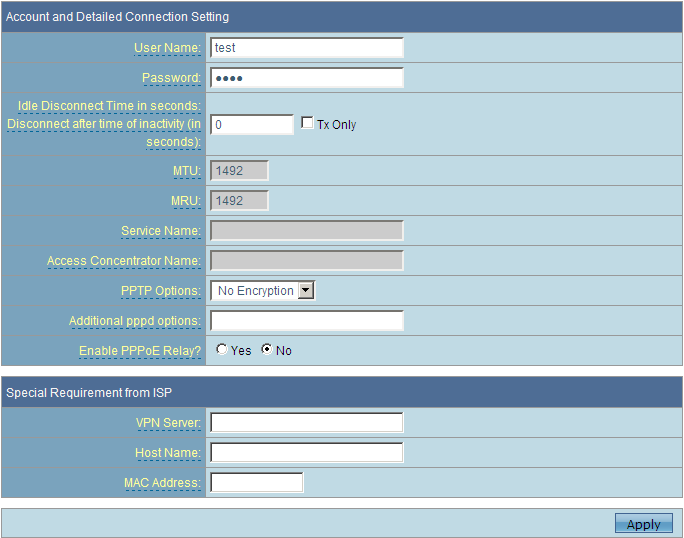 To make sure that the device is in the right mode use ping for the IP-address previously assigned to the LAN interface. If ICMP echoing back comes with TTL=100, this is what you need. Then you need to transfer the firmware file via the TFTP protocol and wait for about five minutes for the router to install the received image and reboot. Hereby we finish the review of firmware upgrading variants. We’re not going to give a detailed review of all the functions the user gets access to via the web interface of the wireless router but will only list the most interesting ones. 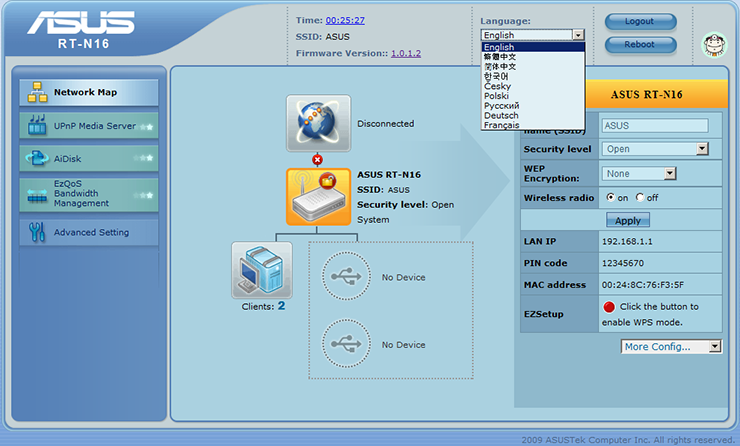 The Asus RT-N16 web interface is very similar to the one we’ve already seen with the RT-N15 model. To log in you have to enter login and password which are traditional for ASUS devices: admin/admin. For managing the device we used the Opera 10.10 (Build 1893) browser, though latest versions of Internet Explorer are recommended. After authentication the administrator finds himself on the RT-N16 main page which has brief information about the state of the router. Here the user can choose one of nine languages of the web interface. As compared to the RT-N15 model there’s a new menu point Media-server UPnP. If to choose this point, the user will see a page where he can turn the service under consideration on and off. We’ll look at this option in more detail in the Testing section. 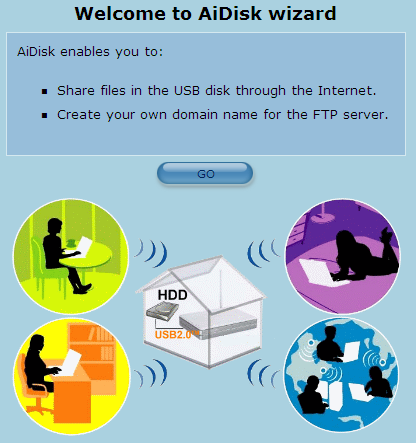 Also there’s a new AiDisk point which allows configuring shared access to files. Besides configuring access rights to the files on the removable flash-card, here one can also configure DDNS for the files to be readily accessible from outside by name. However, we won’t do this in our review. 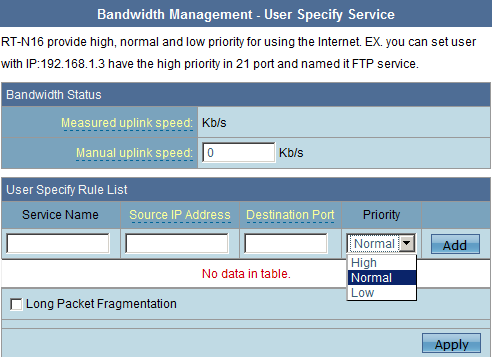 The Bandwidth management menu EzQoS was already present in RT-N15, however we decided to study it as well, because some additional settings have been added in RT-N16. Now the administrator can “take away” the bandwidth from P2P applications or limit them. 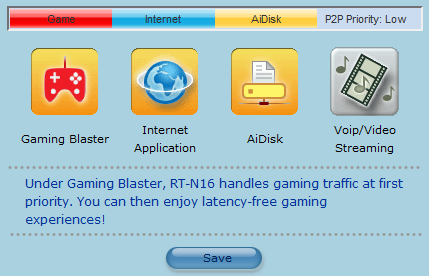 For instance, in choosing types of traffic Gaming Blaster, Internet Applications and AiDisk, P2P applications are assigned low priority, and if the VoIP and Video streaming are on, the bandwidth of P2P is limited to 10%. 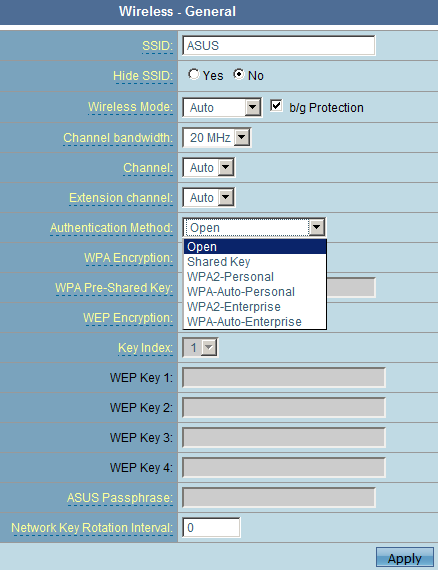 It’s possible to make even more precise bandwidth configuration on the QoS tab in the WAN point of the Advanced Setting menu. For example, here you can manually configure priorities for different applications as well as set if it’s necessary to enable long packet fragmentation. 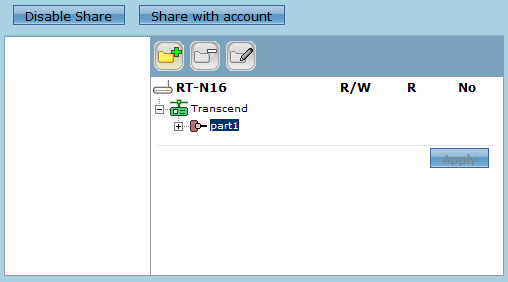 The Advanced Setting menu itself displays to the administrator all available groups of configurations. Let’s describe the most interesting of them. 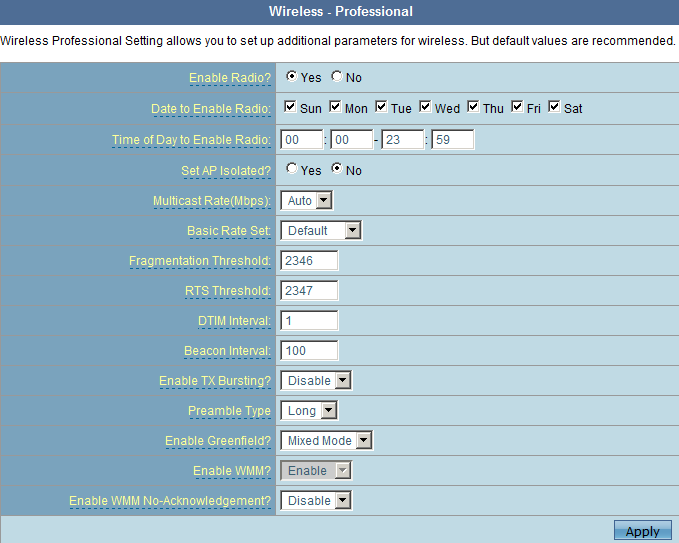 The Wireless – General item allows configuring all the parameters usual for a wireless network. 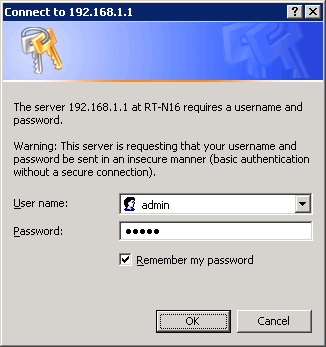 If you choose enterprise user authentication methods, in the same-named column you’ll need to configure RT-N16 for work with a RADIUS-server of the company network on the RADIUS (Remote Authentication in Dial-In User Service) Setting tab. Now let’s turn to the Professional tab of the same group. Here the user can enable or disable the whole wireless module of the router or set its uptime. 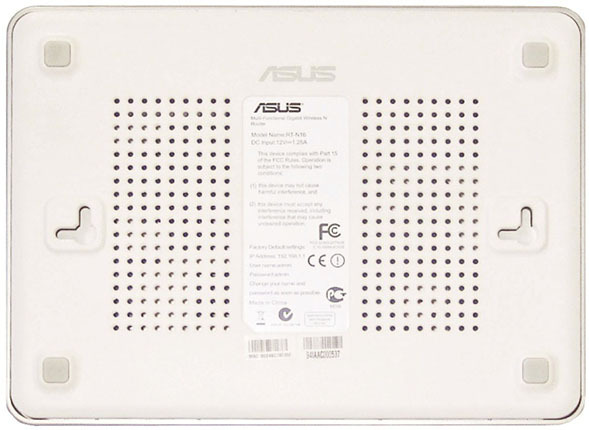 ASUS RT-N16 supports multi and broadcasting over the wireless segment of the net. The maximum rate-limit can be configured for multicasting. The Greenfield option makes it possible to go away from compatibility with previous standards of wireless connection and at this expense to increase the data transfer speed in the wireless segment. 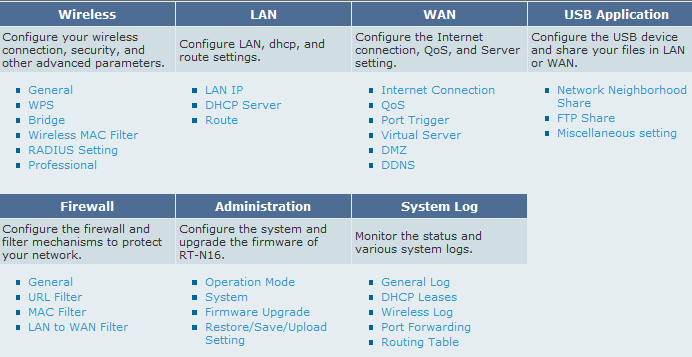 Routing configuration is performed on the LAN-Route tab. RT-N16 can dynamically receive routes via the DHCP protocol which is used by some Russian providers, or they can be configured statically. Unfortunately, the device at hand with official firmware cannot use the dynamic routing protocols (RIP, OSPF, BGP). 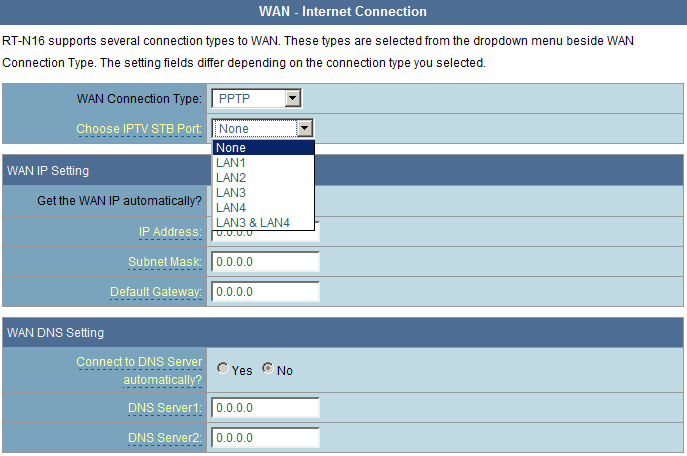 On the Internet Connection tab of the WAN group the administrator can configure the type of the connection to the provider: static or dynamic IP, PPPoE, PPTP or L2TP. When choosing PPTP or L2TP one can additionally specify if he wants to configure IP-parameters manually or get them automatically for the physical interface. Besides, one can choose a local port onto which IPTV traffic will be redirected. Unfortunately, we failed to find an option for setting time between consecutive connections to the server. In our view, it is a simple but handy function as some Russian providers require that the user tried to connect to the server not earlier than a minute after disconnect. 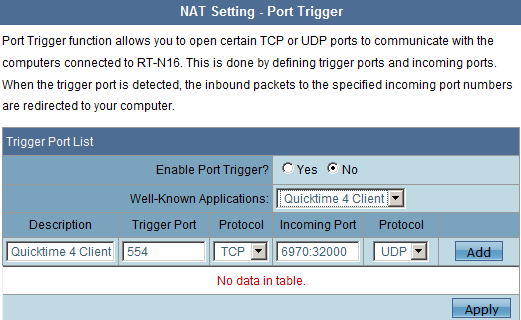 The Port Trigger tab of the WAN menu allows configuring user data redirection in a specific manner: when activity on a triggering port from some local computer is detected, all data from the ports specified in the Incoming Port field will be redirected to this host. 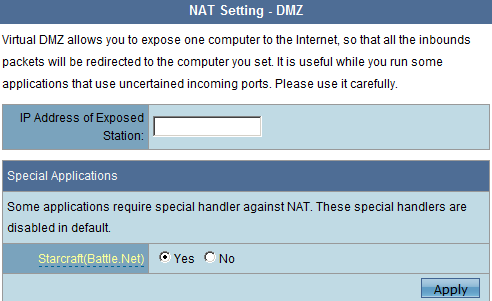 The DMZ tab allows putting one of the local computers in a demilitarized zone. Besides, here you can switch on additional NAT settings for certain applications such as, for example, Starcraft for the Battle.Net allowing the multiplayer mode. Now let’s turn to the USB Application group which includes three tabs: Network Neighborhood Share, FTP Share and Miscellaneous setting. 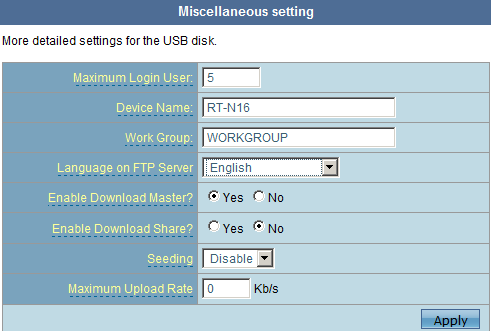 The first two tabs allow configuring the settings of the user access to files stored on a flash drive, whereas on the Miscellaneous setting tab the administrator can set the names of the device and the workgroup, limits on the number of login users (5 max) as well as other parameters related to downloading managed via the Download Master. Now let’s look at the Firewall group. 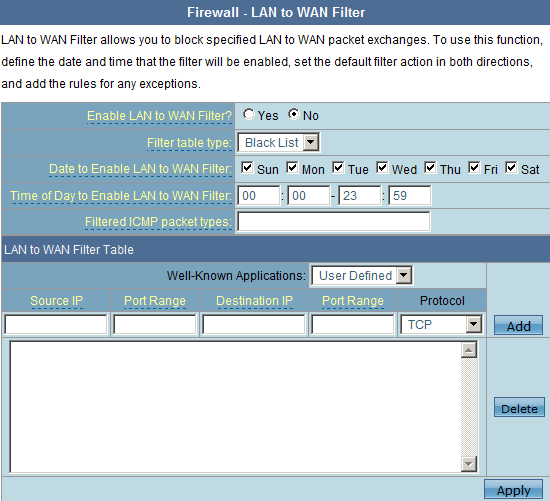 Here our attention was caught by the point “LAN to WAN filter” which allows enabling or disabling certain connections from the LAN at a certain time interval. 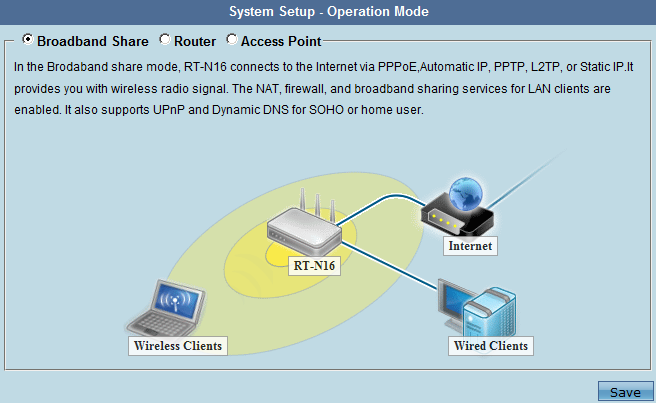 The point “Operation Mode” in the Administration group allows setting the working mode of RT-N16: a Broadband Share, a Router or an Access Point. The first two modes differ in the following way: in the Broadband Share mode the device performs addresses/ports translation functions (NAT/PAT) while in the Router mode it doesn’t. The System Log group contains the following tabs: General Log, DHCP Leases, Wireless Log, Port Forwarding and Routing Table. Let’s have a closer look at the Routing Table tab. It may first seem that this tab is redundant as all the settings may be configured on the Route page of the LAN group; however, this is not so. 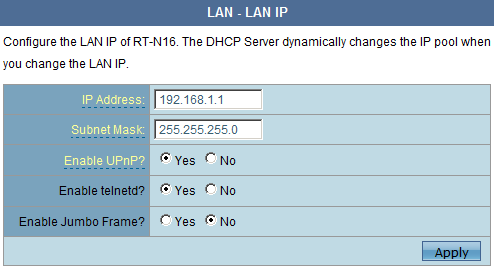 RT-N16 can receive routing information from a DHCP-server as well. These data can only be found in the Routing Table of the System Log group. 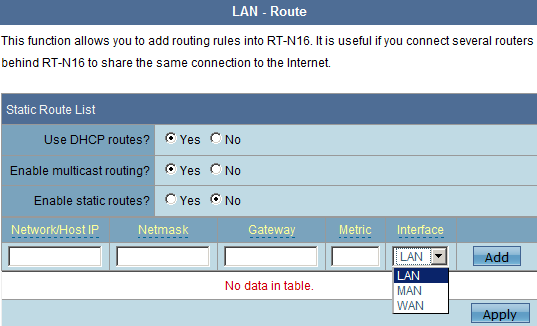 Here we finish our brief review of the wireless router RT-N16 web interface features. To finish on a funny note, we’d like to show you a message that made us smile: ASUS has long been quite good at translating its interfaces into Russian, but goofs can still be seen. Access to the command line interface in ASUS RT-N16 is performed in the same way as in RT-N15, i.e. by means of addressing to a special hidden administrative page http://192.168.1.1/Main_AdmStatus_Content.asp. But this time it’s not enough to type in a command. It is necessary to type in the four strings below and click “Refresh” every time. After we started telnet daemon on the router it is high time we connected to it by means of the similar protocol. We draw your attention to the fact that access is possible from all interfaces and doesn’t require entering a password. We can’t but mention that in the latest versions of firmware (Version 1.0.1.2 was used) enabling and disabling access to telnet daemon is performed on the LAN IP tab of the LAN group Advanced settings. Changing the interface password leads to changing the telnet password as well. Like other ASUS models RT-N16 uses BusyBox. In the tested 9.9.4.75 firmware version 1.7.2 of BusyBox was used. When the article was being written the latest available version was 1.15.3. By means of busybox calling it is possible to look through additional information regarding the shell itself, the OS kernel and the list of available commands. It is pleasant to realize that the number of commands has increased in comparison with RT-N15. Besides, the BusyBox version is displayed both in the web-interface and in the General Log tab of the System Log group. Also we've decided to see what processes are being run on the router. Let’s see what commands are available in catalogues /bin, /sbin, usr/bin and usr/sbin. Let’s proceed to the catalogue /proc and see what files are located there. Let’s estimate RT-N16 CPU load. For this we look through the contents of the uptime and loadavg files. There are two numbers in the cat uptime output. These numbers are responsible for uptime and idle time respectively. The first three numbers in the cat loadavg output indicate average loading of the device within the last 1, 5 and 15 minutes, respectively. As we can see our router is not busy at all. Let’s try to get information from the command line interface regarding the hardware platform in use. You can review the list of supported file systems in the /proc/filesystems file. 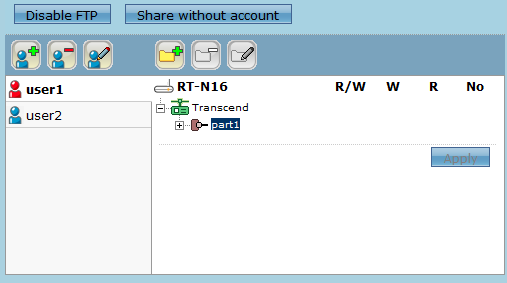 If it is necessary to review the content of flash-drives connected to RT-N16, it can be done in the sub-folders of the /shares catalogue. In the /shares catalogue there is an interesting file - redirect_rules, responsible for redirection of inputs. Therefore, for example, a built-in web-server opens the 80 TCP-port, but not 18017. Data to the second port are transferred automatically. We can check this by means of a netstat call, indicating ports waiting for connection. We’d also like to draw your attention to another interesting command nvram which allows looking through and changing some system settings. The full list of available commands can be got by means of an nvram show call. Unfortunately, not all parameters change leads to the expected result. For instance, we failed to configure the speed of the router’s WAN-port, though the web interface access login can be readily changed whereas such operation is impossible from the web-interface. It’s also possible to get the password for connecting PPPoE which was configured on the router. Please, keep in mind that all changes you perform with the help of the nvram utility should be very well-considered as mistakes in configuration will result in full or partial inoperability of RT-N16. Another interesting command is poweroff which allows simply turning the device off. This is not exactly the shutting down users of notebooks and PCs are used to; in this case only the operating system shuts down, though all light indicators remain on; i.e. ASUS RT-N16 no longer performs its router functions. It’s impossible to remotely turn the device back on without special equipment, only by switching the power off and back on. Connection to host is lost. Hereby we finish the short review of the command line interface. First, let’s determine the router’s booting time. By booting time we mean the time interval from switching power on to the arrival of the first echo reply via the ICMP-protocol. In the case of ASUS RT-N16 we have to step away from this traditional approach, because the results of pinging are a bit strange. As you see, the first echo reply comes on the 6th second of booting after which the device stops responding for a while and resumes stable replies after 25 seconds of booting. It’s worth noting that in the first group of replies we see TTL=100 whereas it’s TTL=64 in all others. So, what replies to our requests at the very start of booting? As we already know from the section devoted to the firmware upgrade, it’s the boot loader; that is approximately on the 6th second it boots itself and then continues booting the main firmware. So, the ASUS RT-N16 wireless router booting time is 25 seconds. The second routine test we hold is the router’s security test that is held with the help Positive Technologies XSpider 7.7 (Demo Build 3100). It’s worth mentioning that testing was held from within the local net connecting to one of the LAN-ports of the router, because more services are available from inside. Altogether we found nine open TCP-ports and one UDP port: UDP-53 (DNS), TCP-80 (HTTP), TCP-515 (Printer), TCP-1780 (Dpkeyserv), TCP-3394 (D2k-tapestry2), TCP-3838, TCP-5473, TCP-9100, TCP-9998 and TCP-18017 (HTTP). The most interesting insecurities are presented below. 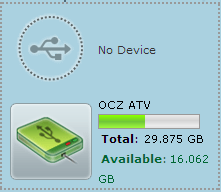 For testing the data access rate on a flash card connected to one of the RT-N16 USB ports we used an OCZ ATV 32 GB flash drive. On the drive, there was a logical disc with the NTFS file system. Support of this file system for reading and writing is a pleasant addition to other features of the device. For a start we connected it to a PC and measured write and read rates of one big file and got that data are transmitted at the speed exceeding 150 Mbps. Then the same card was connected to the router. We performed reading and writing of one big file via the FTP protocol with the help of Internet Explorer 8 x64 and got that the download speed was 61 Mbps, whereas uploading went at 63 Mbps. At uploading, the plot of the channel utilization is very uneven, whereas downloading gives stable speed. Beside the FTP protocol, one can get access to files with the help of NetBIOS. We connected a network drive and checked the access rate with the help of an Intel NAS Performance Toolkit utility, version 1.7.1. In some tests the results obtained were influenced by the limitations of the drive itself, that’s why the flash drive mentioned above was replaced by several hard drives to remove intrinsic limitations. Below are maximum speed values got from different drives depending on in what test this or that drive provided faster transfer. The numbers, we must say, are pretty impressive. We haven’t yet come across such access rates on an external drive connected to a SOHO-router. Another interesting feature of ASUS RT-N16 is the presence of a UPnP media server as we’ve already mentioned in the web-interface section. There aren’t many settings of this service: you can only enable or disable it. All required multimedia files should be placed in the corresponding catalogues of the share directory. 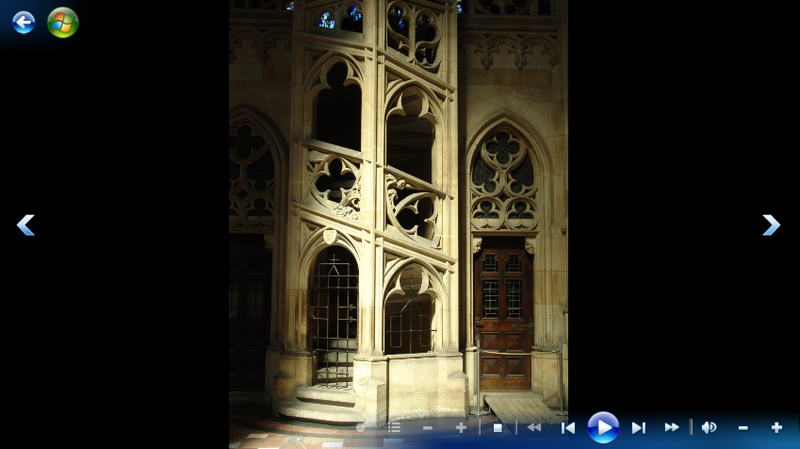 We put video, music and photos in the corresponding folders and started Windows Media Center player on a PC with the Microsoft Windows 7 x64 operating system. With the help of this player we addressed the tested RT-N16. We readily got access to the video, music and photos. 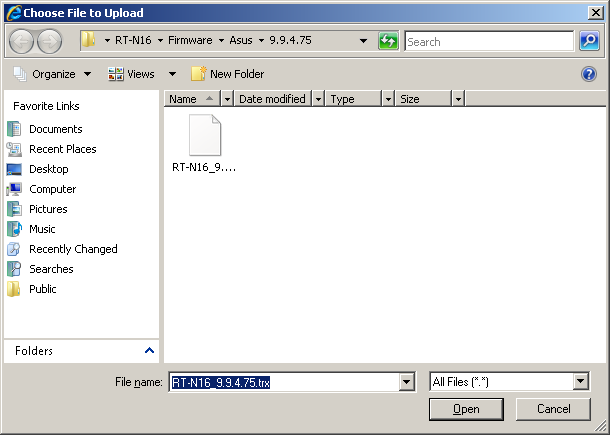 It is fair to say that Russian file names are recognized but ASUS RT-N16 doesn’t understand Russian tags in the properties of the files themselves. When watching films Windows Media Center first downloads the whole file and caches it, only after which it starts playing the video. It means that if the file is 2 GBytes in size, you’ll have to wait for its downloading for about 5 minutes. Naturally, we reported this fact to the vendor. In new firmware versions this problem with preliminary downloading the whole file has been solved (we checked with version 1.0.1.4). 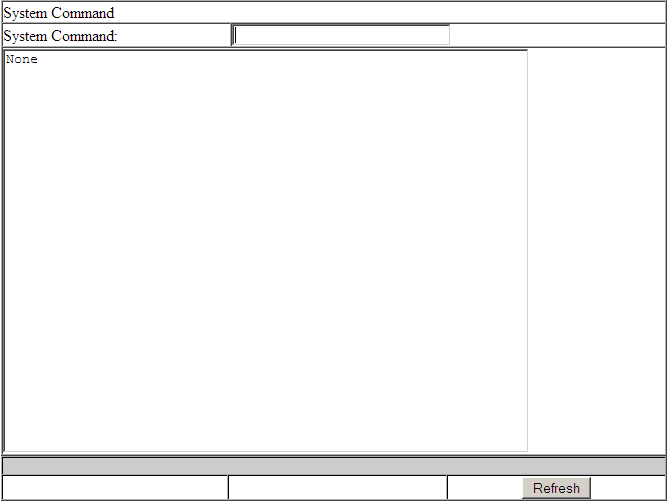 Also we decided to check out the problem which is of interest for some users – arpping requests processing. Let us explain what the problem is. Some providers send on users’ ports specially formulated arp-requests about IP-addresses that are not present in the user’s segment but which are most often assigned to routers’ LAN ports. If arp-replies to these requests come from the user, this most probably says that a router is being used, which may be prohibited by the client agreement. Sanctions follow up at once. We left the IP-address on the LAN interface “as is” – 192.168.1.1/24, and set the Static IP mode on the WAN-port and address 192.168.0.1/24. To the computer connected to the WAN interface we assigned 192.168.0.2/16 address and pinged 192.168.0.1 and 192.168.1.1. 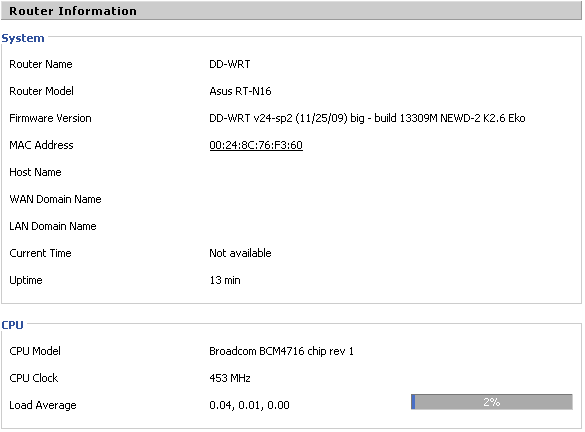 This made our test PC first send broadcast arp-requests towards the ASUS RT-N16 WAN port. The router sent us arp-replies about both addresses, which in our view is not correct behavior. We reported this all to the vendor and hope that this problem will be sorted out in future firmware versions. 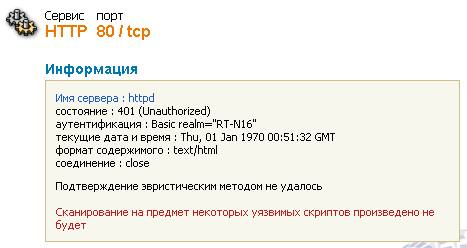 Another peculiarity we found was lack of support of Cyrillic domains in the web-interface. So, for example, if a provider registered a domain провайдер.рф and on it located authorization servers with a general name впн.провайдер.рф, it’ll be impossible to connect to these servers by name with the help of RT-N16. Perhaps, the most interesting and much awaited test is the measurement of the data transfer speed through the router. We’d like to say right off that the speed measurements were made on the latest available firmware version 7.0.2.33 as it was recommended by the vendor because in it the transfer speed through the PPTP tunnel had been significantly increased. We’d like to explain why this speed is so important for the end-user. 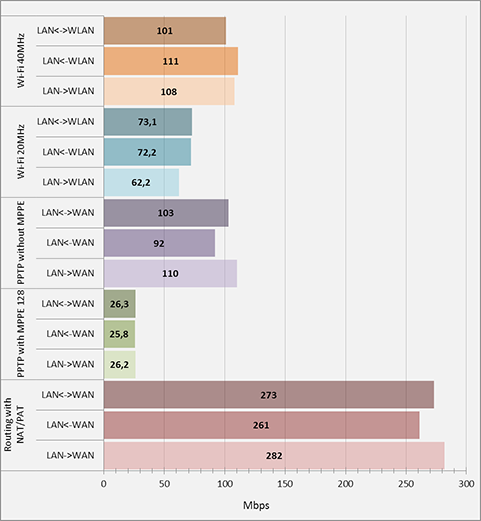 Traditionally, modern SOHO-routers demonstrate rather high transfer speeds with simple routing with NAT/PAT and through the PPPoE tunnel; however transfer speeds with the help of PPTP leave much to be desired in most routers. Choosing a high-speed plan from the provider, the user hopes to download data at this particular speed, but unfortunately the router may become a weak link in this scheme as its resources are often not enough to support plans with ever-increasing access speeds to the global net when using PPTP. Setting up access to the internet with the help of PPTP is a very popular solution in Russia; that’s why the speeds provided through PPTP are so important, because even having access to the provider’s local net at the wire-speeds, the user will be limited in the access speed to the global web. So, let’s begin! For the measurements we used the JPerf utility version 2.0.2 and the parameters of the test computers are presented in the table below. We’d like to emphasize that we didn’t use any special screened room for measuring the characteristics of wireless transmission – just a regular office with working electronic equipment and several wireless networks of average activity. Also, we didn’t seek for a particularly beneficial mutual location of the antennas and the wireless devices themselves. It means that we well admit that a user may get higher speeds in a less noisy environment. First we measured the speeds of routing with translation and got average rates below 300 Mbps. Then we measured the speed of data transfer via Wi-Fi on the channels of 20 and 40 MHz width; the obtained results were ordinary and quite expected. After that we started Windows Embedded VPN Server on one of the hosts and tested the transfer through a tunnel. The results were quite stunning: the speed of transfer through PPTP with MPPE was about 26 Mbps and it exceeded 100 Mbps without MPPE which is higher than the wire-speeds of most providers not only in Russia as a whole, but in both capitals, too. We don’t think it’s worth speaking about the uniqueness of the obtained speeds for the whole world as the popularity of PPTP drops drastically outside the CIS. All the results of speed tests are gathered in one table and presented in a diagram. Here we’d like to finish the testing section and sum everything up. The review of ASUS RT-N16 has been in our test laboratory for about a year – it’s perhaps the longest-lasting material we’ve ever had. Writing of the review and testing of the router have been constantly put off for different reasons and as a result there’s a significant inconsistency in the described firmware versions and the software used. However, everything finally comes to its end, and here we’re happy that it does. Over the time of testing the company has corrected an appreciable number of errors in firmware and we even had an impression that ASUS made error correction its serious business. A confirmation of this is, for example, abrupt increase in the PPTP performance. The achieved speeds of data transfer through PPPoE and PPTP tunnels allows us to certainly recommend RT-N16 for connecting to providers supplying high speed internet access. The availability of a big number of alternative firmware versions makes this wireless router interesting for network enthusiasts and Linux guru. Below are the strengths of ASUS RT-N16. Support of several interface languages (including Russian). Existence of a substantial number of alternative firmware versions. Excellent data transfer speeds through PPTP. Excellent access speeds to files stored on USB-drives. The possibility to turn the wireless module of the router off at schedule. However, one can’t but mention the drawbacks of the device. The impossibility to set a time interval between consecutive attempts to connect to a VPN-server. Lack of support of Cyrillic domains. 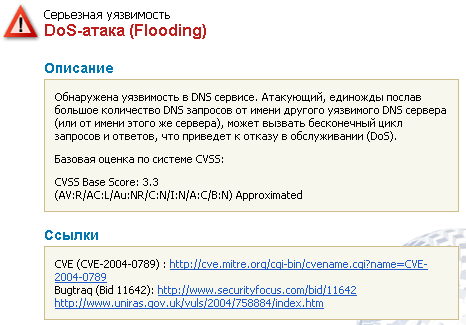 Presence of a possible DoS attack against the router’s DNS-daemon. Mediocre routing speeds with NAT. 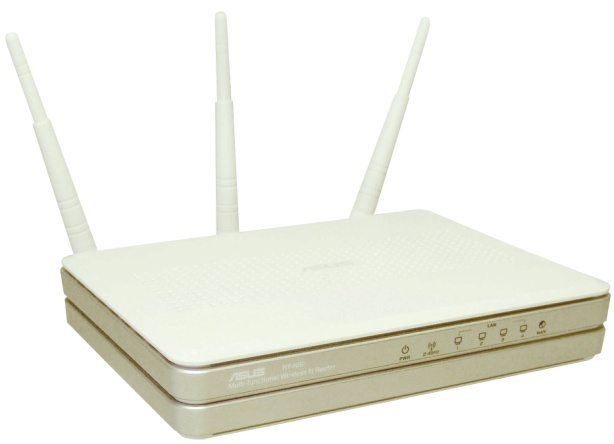 We think that in the long run ASUS has managed to practically finish off their top model in the series of wireless routers of the 802.11n standard – RT-N16. When the article was finished, the average price for ASUS RT-N16 in Moscow internet shops was 4400 rubles.